Managing and supporting the railroad related content of the websites hosted at TrainWeb is an all volunteer effort of the 501(c)(3) non-profit organization, the American Passenger Rail Heritage Foundation (APRHF.COM). For further information about the APRHF, please click here. Managing and supporting the railroad related content of the websites at TrainWeb has always been an all volunteer effort. 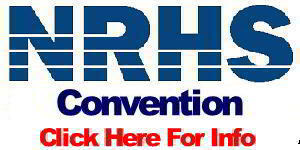 As of January 1, 2013, the volunteer nature of this effort was made official by turning responsibility over to the APRHF. Mostly it is still the same people volunteering their time and effort that have been doing so for the past several years. They will just be wearing an APRHF hat instead of a TrainWeb hat. However, the product of these efforts will continue to be found at TrainWeb.com, TrainWeb.org, and the many other railroad related websites hosted free by TrainWeb LLC. The goal of TrainWeb has always been to provide a free online location where train enthusiasts and rail related clubs and organizations could share their knowledge, photos, news and events. The websites of TrainWeb have been a labor of love since the day TrainWeb was founded in 1996. It has always been an all volunteer effort without any paid staff providing or managing the content of the websites. All the rail travel reports posted to TrainWeb have been provided by volunteer correspondents. There are also over 1000 rail related websites hosted at TrainWeb.org, each managed by individuals or rail organizations that volunteer their own time to share their information and photos with the rail community. Even the management and technical support of the websites has been an unpaid volunteer effort. Since it has always been an all volunteer effort, we are just making it "official" by placing this effort under the umbrella of the APRHF, a 501(c)(3) non-profit organization whose main goal is to preserve and promote passenger rail heritage. If you operate your own website that is hosted at TrainWeb.org, nothing will change. Your website will continue to be hosted for free on the TrainWeb.org web server, you will still manage the content of your website, and you will continue to be provided free additional disk space for your railroad related content and photos as needed. When TrainWeb first started in 1996 it was built on a business model similar to TV and radio, providing free content with revenue and profit coming from paying advertisers. Unfortunately it turned out that the advertising revenue was barely enough to cover the cost of computer equipment, internet access, and the overhead of rent and utilities. For the first few years TrainWeb only survived by the continual influx of investment capital and a lot of unpaid time and effort by the founders and volunteers. Fortunately, a more profitable sideline was discovered in 2003: selling railroad themed party supplies online at TrainParty.com. This new venue became the only profitable side of the business. But the TrainWeb staff didn't want to abandon their original goal of providing an online location where train enthusiasts can share with the railroad community. Thus they continued to put time and effort into the websites as an unpaid volunteer effort. Under the new arrangement, all railroad content of the TrainWeb servers has become the responsibility of APRHF. That content is now managed and updated by APRHF volunteers. Most of those volunteers will be the same people who have been managing and updating the content of the TrainWeb servers from the beginning, but APRHF is seeking additional volunteers with the interest and skills needed to help maintain and grow the railroad content and participation in this online community. A new company, NordiLusta LLC, based out of Vancouver, Washington, in the Pacific Northwest, will manage the web servers that host TrainWeb.com, TrainWeb.org, and all of the other railroad related web sites. The company "TrainWeb LLC" has been split off to be a separate entity devoted to selling railroad related party supplies at the TrainParty.com web site. "TrainWeb LLC" is no longer involved with the ownership or management of the "TrainWeb.com" or "TrainWeb.org" web sites. TrainWeb LLC and NordiLusta LLC no longer have any ownership in common between them. NordiLusta LLC will continue to provide free web hosting for the TrainWeb.com and TrainWeb.org content and online community as TrainWeb LLC had been doing for many years. In exchange for the free web hosting, ads will continue to run on the web pages to generate the funds needed to provide the free web hosting. WHAT ELSE DOES APRHF DO? Taking on responsibility of the railroad content of the TrainWeb servers is just the latest venture of the APRHF. The APRHF is devoted to the preservation and promotion of American passenger rail heritage, including the history of Amtrak. The APRHF is national in scope but has its headquarters and physical presence in Silver Rails Country near the Amtrak Station in La Plata, Missouri, on the route of the Amtrak Southwest Chief. The APRHF will continue to feature and expand its collection and displays of railroad heritage in Silver Rails Country while it expands membership and activities nationwide. 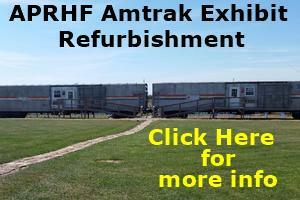 The APRHF manages an exhibition of Amtrak history. Housed inside 2 ex-Amtrak Mail Handling Cars (MHC), the exhibition features the memorabilia collection of the Amtrak Historical Society which includes many items from the early years of Amtrak. 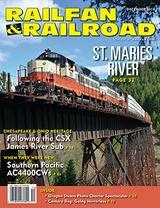 Also featured are Amtrak items collected and donated by TrainWeb LLC and many others featuring Amtrak through the years. Like the APRHF Silver Rails Gallery & Memorial Library, the APRHF exhibition of Amtrak history is located in Silver Rails Country and staffed by APRHF volunteers. The APRHF manages the displays of railroad heritage in the Depot Inn & Suites. The hotel located in Silver Rails Country in La Plata, Missouri, has displays of railroad heritage throughout the building and the grounds. Many of these displays are rotated at times by APRHF volunteers. The APRHF manages a rail lookout cabin and deck. Overlooking the BNSF main trans-continental rail line this cabin provides a heated year round shelter for train enthusiats to enjoy watching the frequent freight trains and twice daily Amtrak Southwest Chief. Free Wi-Fi, electric power, gas heating, BBQ, restrooms and a large deck above the tracks make this lookout point a railfan's paradise. This lookout point was dedicated and named the "Chris Guenzler Millionth Mile Rail Lookout" as it opened on the arrival of Chris into La Plata at the completion of his one millionth mile of rail travel. 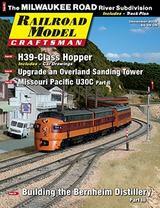 The APRHF manages the historic Santa Fe Depot / Amtrak Station in La Plata, Missouri. APRHF volunteers preserve the historic aspects of the depot as well as maintain the grounds for use by Amtrak passengers. 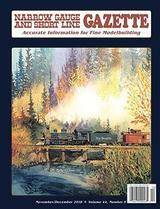 The APRHF publishes the Silver Rails Country Map. This is a comprehensive guide to all the train enthusiast attractions as well as many other heritage and tourist locations throughout Northeast Missouri (NEMO). A new related effort is the creation of the Silver Rails Wine Trail which will feature wineries and wine tasting rooms located in Northeast Missouri, including the new Silver Rails Vineyards that is now being planted and will feature railroad themed wines! Please click here for more information about the APRHF. APRHF volunteers are mostly located in Missouri and Southern California but we welcome those interested in opening local chapters anywhere in the nation. The APRHF could certainly use your help if you'd like to volunteer your time or funds. Right now the APRHF is having a major membership drive. The APRHF would like to grow to 1,000 members pledging at least $5 per month. If you could pledge just $5 per month, that would go a long way toward helping the APRHF maintain its current venues as well as achieve its future goals. For more information on the goals of the APRHF, please click here. For more information on pledging $5 per month, please click here. 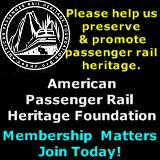 APRHF thanks you for your consideration of helping support passenger rail heritage! To read about the detailed history of TrainWeb, please click here.